2 BR in house and 2 BR over garage. 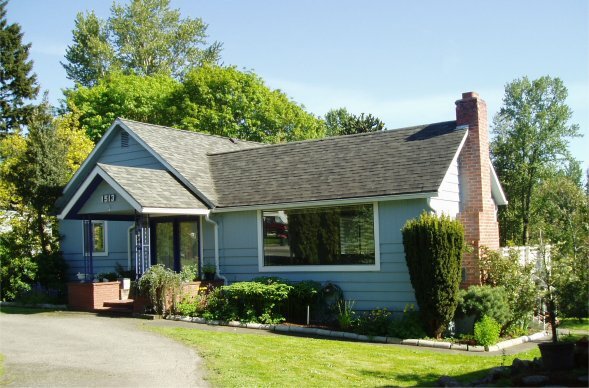 1200+ square foot house with 1700+ square foot garage (24 x 36) located on Second Street in historic Snohomish. Daylight basement. Second Street and Avenue G. Large lot in town, close to Historic District, Farmer's Market, Shopping, Hal Moe Pool, Library, Parks, Public Boat ramp, River walk, and Bus Stop. Easy access, off-street parking with circular driveway and RV parking. House built in 1906 for Railroad employee use. Major remodel in 1969, PUD package, recent updates. Fresh new interior paint, new carpet, new bathroom flooring, new slate hearth in front of Lopi certified woodstove. Atrium/sunroom with slate floor, skylights, lots of low-e windows, sliding door, and deck. Bamboo floors in kitchen, hall, and laundry room. Second large deck behind the garage. Mature landscaping includes Rhodies, Camelias, Azaleas, Viburnum, Holly, Dogwoods, Hawthorne, Lilacs, Monkey Tree, Evergreens, Columbine, California Poppies, Roses, Astilbe, Blueberries, Oregon Grape, Salal, Hyacinths, Irises, and more perennials and trees. Snohomish River view and Snohomish Valley territorial view. Hot air balloons, parachute jumpers, and Amtrak views. Garage roughed-in for upstairs apartment. 2 bedrooms finished with paint and carpet. Possible home business - check with CIty of Snohomish for types of businesses allowed. Zone Medium Density Residential. Great investment potential as rental. Lot well above flood plan - not impacted by November 2006 flood. 12-month lease, credit check required. $1200 per month rent + $1500 deposit. Possible purchase option. First / Last / Deposit. or send email dorothyreagan@remax.net. .
Click a thumbnail to view larger photos in a new window. 3 blocks to Snohomish High School. 4 blocks to CT bus stop for Everett and Monroe. 4 blocks to historic downtown shops, restaurants, and river walk. 1/4 mile to Highway 9. 1/2 mile to Harvey Airfield Snohomish Parachute Center. 1 mile to Highway 2. More photos and information at remax.com. 3 bay garage with shop space, 850+ square foot first floor. Garage door openers. Single bay and double bay. Exhaust fan on timer downstairs and attic fan. 2 BR apartment upstairs, 850+ square foot, mostly finished. Kitchen and bath roughed in. Bedrooms and living area finished, paint and carpet in 2005. Laundry room wired. Wired for 110V and 220V. Perfect for a quiet at-home-business, extended family, or potential rental.